Next to trains, museums and shops so very convenient. Big room and separate attached bathroom. Quiet for sleeping. Although booked as with a shared bathroom, I was given a room with toilet & hand basin as I was the only lady staying - a nice gesture. Comfy & clean bed. The staff was very friendly and helpful. The Indian Rose tandoori opposite was excellent. Really nice Atmosphere. 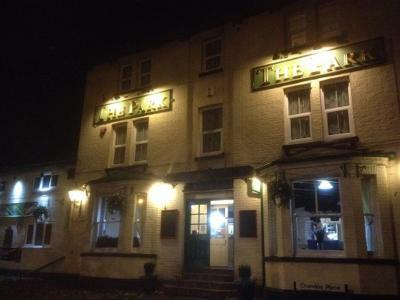 Friendly Staff, Comfortable Bed, pillows etc, great cozy traditional pub downstairs (Pool, Darts, Jukebox, TV etc). Location was good for what we wanted, it was cheap and bed was comfortable. Staff were friendly when we arrived. Got an external door key so could let ourselves in at whatever time, which suited us as we were at a party that went on into the small hours. Good location next to the railway station and room was very quiet, dispite being quite close to the railway line. Small but comfy room and bed. It was very basic but clean and functional. Hot water was non existent. The sign in the en suite said run the hot tap for a bit to get it through but after 10 mins of running, it only got luke warm. I was glad I wasn't having a shower that day. HOwever, if you want a cheap place to stay, it's fine. Bletchley is ghastly and the only reason to go there is to see Bletchley Park. The booking was straightforward and all online, so 10/10 for that. Once we got used to the Park, it actually was fine and did the job. There is no breakfast, but there is Wetherspoons in the town, so that was no problem. I do recommend it but only for a cheap and convenient night's stop-over, not a romantic break or somewhere to impress your partner!! When would you like to stay at The Park Guest House? These rooms come with private bathroom. This room has a shower only in the room, the toilet and basin are external and shared. We would like to add the following to our property information. Ideal contractor accommodation. House Rules The Park Guest House takes special requests – add in the next step! The Park Guest House accepts these cards and reserves the right to temporarily hold an amount prior to arrival. The accommodation was very basic, a little shabby but clean. The shower has black mold between the tiles and it's a bit of a wait for the hot water to arrive. Bed was hard and uncomfortable and so were the pillows. quite noisy with people in and out all hours of the night. No breakfast no local café that opens early. If your looking for a cheep basic base then this place is for you. if your looking for all the comforts of home then don't book here. The internet service was the most frustrating I have ever used. You had to keep logging in every thirty minutes. The stairs were steep and narrow and the tv remote was in need of new batteries. Everything, very impressive building, fab food. Nothing, for price (£48 / night) cheapest room I could find near to MK. Rooms were not in the best of condition, our secondary double glazing was propped open with a piece of wood with a sign on the window that it wouldn't stay open. Toilet had no loo roll in it. No hand basin in the toilet, you had to go through to the shower room to wash your hands. Decor very tired. Narrow steep stairs. A fire door opened directly on to the first step at a top of a flight of stairs. Can imagine that being awkward if you had a suitcase, I only had a small rucksack as only stayed one night. Next to an overhead rail line and a busy road, although, our room was at the back of the property so any noise didn't really affect us, but, something to bear in mind if you get a front room.